Join the discussion on our forums! Come discuss Primordial Drake over in our dedicated Primordial Drake discussion topic. I can see why it is one of the important Jade Druid cards , because of the pure effect power to deal 2 damage all around and big taunt body. This card is a big f you to priest, instant win on a empty board. Nicely designed card. The Mana Cost, Stats and the Battlecry are well distributed and balanced. Plus, being only an epic is also a major bonus. How can this be in any way balanced? Volcanic potion effect costs 3 mana so it's 5 mana 4/8 taunt dragon. Dude, there is something we called 'mana cost'. You can play volcanic potion on 3 mana, which curves well in the early phase if it is in your hand. 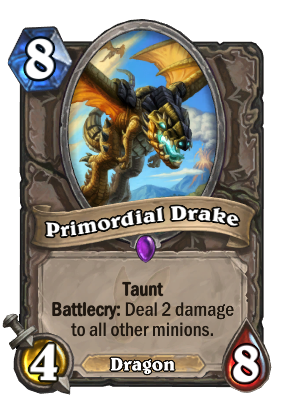 Meanwhile, the primordial drake is 8 mana, which means you cannot immediately play it in the early game (unless you are Druid and ramped so well). Plus, one is a class card, while the other is neutral. While you are at it, why don't you just play the drake in your mage deck instead of volcanic potion, no? I doubt you will, because of the mana cost. IMHO, the two cards are incomparable. Horribly OP. Should be 4/4. Abomination is 3 mana cheaper than this guy, I think +4 health and Battlecry instead of Deathratte is a fine trade for playing it 3 turns later. A little bit of Toronto love with the flavour text.